CAMBRIDGE -- Sweet, spicy, tangy, and bold were synonymous with chef John Levins's food during his tenure at Cambridge's Green Street Grill. These same assertive tastes, which originate with his roots in the Caribbean, are perfect for cutting through the haze of New England's humid summers. The best part, as Levins demonstrates in his Cambridgeport home, is that the biggest flavors can be created in the smallest spaces. Levins moves balletically around his tiny urban kitchen -- a compact, crowded room livened by family photos, postcards, and a vase of sunflowers -- and his training shows. His knife flies faster than any food processor possibly could while he prepares a lively summer meal of seared pork loin with roasted vegetable relish, and a fruity, crunchy salad. The former restaurant chef has a new career. 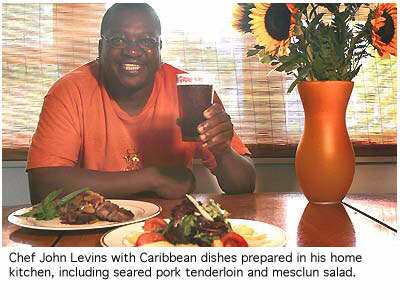 Less than a year ago, Levins, a 46-year-old native of Nevis, launched Something Savory Catering, in partnership with Jodi Auerbach, a former catering manager at Boston Harbor Hotel and Green Street. ''I always did some catering," says Levins. ''I just started to take it seriously last fall." As sun streams into his second-floor apartment -- the stove, counter, and sink are only steps from one another -- Levins pours a healthy amount of olive oil into a pan and heats it over a high flame; then with a quick turn to the counter right behind him, he assembles mango, tomato, avocado, salad greens, and jicama that will make the cooling salad. Working in a small space has its advantages: The flip side of crowded is efficient. ''My kitchen is not a great kitchen," he says, ''but it's productive enough. It's just a matter of thinking ahead." His philosophy: ''Prepare early and clean as you go." To that end, he has already blackened red, green, and yellow bell peppers, chosen for their color and varying flavors, along with other vegetables. He's making the relish to accompany the pork. ''I would punch it up a bit," he says, indicating a poblano chili pepper he has on hand. Then he takes a Niman Ranch pork tenderloin, noting that any pork will do, and coats it liberally with coarse salt and black pepper. He rinses the roasted peppers, deftly removing their charred skins. One more turn and the seasoned pork goes into the hot pan, then he sets it aside. ''Let's just forget about that for a few minutes," he says. Levins starts the dressing, darting to the refrigerator for orange and pomegranate juice and reaching up into tall wood-grained cabinets for balsamic vinegar. With basil and shallots to chop -- he's working quite fast now -- Levins demonstrates the legacy of a classic French training under Cordon-Bleu trained chef Patricia LaCorte, who operated the Fiddle Leaf Restaurant on St. Thomas. Chopping shallots, he explains why he likes them. ''They make the flavors pop out at you," he says. Laughing as much as he talks, Levins relates his background, how he came to Boston about 25 years ago to work at what was then Rebecca's Cafe and Catering, and then as sous chef at the Harvest. His own recipes came to the fore at Green Street Grill, where he led the kitchen from 1986 to 2001, barring one year when he experimented with his own place in Syracuse, N.Y.
Levins has almost always worked in tiny spaces. ''My first two kitchens I cooked in professionally were really small," he says. ''When I first started working at Green Street, before it was remodelled, the kitchen was just a box, a little box -- all we had was a stove and a tiny grill, and one little sink." What the chef learned to do was prepare as much as he could in advance. In the menu he's making today, he explains, he might have ''completed the relish, because that was an easy thing. And I would have completed the dressing, make those ahead of time to give myself space, and then worked on the main course." His dressing ingredients are in a glass bowl where, as the final touch, he whisks in olive oil until it emulsifies into a lightly thickened mixture. ''If you want a thicker consistency," he advises, ''you can throw it into a food processor." Looking at the vinaigrette, he decides to do just that: a quick whir and it's done, just in time for Levins to spin around and turn the pork, which has begun to brown and fills the kitchen with the wonderful smells of roasting meat. Then it's on to the salad ingredients: He uses a long knife to peel mangoes, and halve and pit an avocado, its rich flesh scooped out for slicing. On a whim, Levins reaches back to the refrigerator for jicama ''for some crunch," he explains. A dash of this and a handful of that would obviously suit him fine, but in deference to his visitor he makes a point of carefully measuring amounts as he finishes up the salad and assembles a light sauce to bind the roasted vegetables. This is home cooking, he says, but also the basis of his new catering venture. His last restaurant job, at Soma in Beverly, was just ''too much of a commute," he says, which is one reason he began Something Savory. The meat, when he carves it, is still slightly pink. ''You can serve it like this," he says, explaining that pork no longer needs to be overcooked to make it safe. Matched with the salad and the roasted vegetables, the pork gives both plate and palate the same bright and intense flavors the chef has become known for. His home-kitchen friendly menu is easily adapted for a backyard grill and made with readily available ingredients. ''You can go to the store and everything you need for this dish is right there." Huge flavors, it seems, can burst forth from the tiniest spaces.